In Liberia, the climate is tropical, hot and humid all year round, with a rainy season from May to October due to the African monsoon, and pretty frequent rains in the other months, except in the short dry season that runs from December to February, which is more marked in the north. In the southern zone, the rains have a relative break from mid-July to late August. Along the coast, the rainfall exceeds 3,000 millimeters (118 inches) per year. In the northern part of the coast, in Monrovia, the capital, rainfall even reaches 5.1 meters (200 inches) per year, with a maximum in June and July, when nearly one meter (3.3 feet) of rain fall per month, and a relative decrease in August. Here the rains are abundant already in April, and still in November. Here is the average rainfall in Monrovia. In the interior, precipitation is less abundant, and it drops even below 2,000 mm (79 in) per year, as you can see from the average precipitation of Zwedru. In winter, from December to February, the rains are rare in the center and north, and the sun frequently shines, although some showers are still possible. The temperature is high, around 30/32 °C (86/90 °F) during the day, and the humidity remains high, especially along the coast and in the forests of the interior. Sometimes, however, a dry wind blows from the Saharan desert, called Harmattan, which can fill the atmosphere with dust. In the inland hilly regions, and especially in the mountain peaks, the highest of which is Mount Wuteve, 1,440 meters (4,724 feet) high, sometimes at night it can be cool or a bit cold. In March and April, temperatures slightly rise, and showers become more frequent. Sometimes it can be very hot, so much so that the temperature can exceed 40 °C (104 °F). The real monsoon arrives in May, bringing torrential rains, especially along the coast. From June to October, cloudiness is frequent, and the daytime temperatures drop below 30 °C (86 °F). Between mid-July and August the rainy front moves northward, so there is a decrease in rainfall, more evident in the south. The last month with rainy weather is November, and the rains already decrease sharply compared with the previous months. The temperature increases a little because of the higher amount of sunshine hours, reaching again 30 °C (86 °F) during the day. Here are the average temperatures of Monrovia, located, as mentioned, in the northern part of the coast. In Monrovia, the sky is often cloudy during the rainy season, but even in the dry winter season the sun does not shine very often. The sea in Liberia is warm enough to swim in all year round, as you can see in the following table. 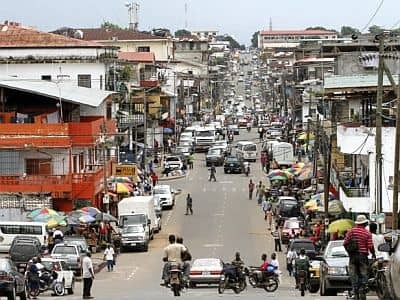 The best time to visit Liberia is winter, particularly in January and February, which are the sunniest and least rainy months. The worst period is from May to October, although between mid-July and August, in the south there is a fairly significant decrease in the rains. In winter: in Monrovia and the northern coast, bring light clothes for the day, a light sweatshirt for the evening, a scarf for the wind-borne sand and dust; in Greenville and the south coast, an umbrella or a light raincoat. In inland areas, it may be useful to bring a sweatshirt and a jacket for the evening. In summer: tropics-friendly, bring light clothing of natural fibers, an umbrella (even though sometimes it is not useful for the most intense monsoon rains), a light sweatshirt and a light raincoat for the long and heavy downpours. In inland areas and mountain ranges, you can add a heavier sweatshirt for wet and rainy days.